You've inherited your family's shop, in a small village near a ferocious dungeon. It's the perfect location to sell potions, weapons, crafting items and other consumables that people will need to explore. And if you're lucky, the rest of the villagers will find a use for what you sell as well. Unfortunately, stock doesn't grow on trees, which means that you're going to have to acquire it yourself. To do that, you'll be heading into the dungeon, slaughtering your way through a collection of dangerous monsters, and butchering their corpses for useful materials. Perfectly wholesome behaviour. 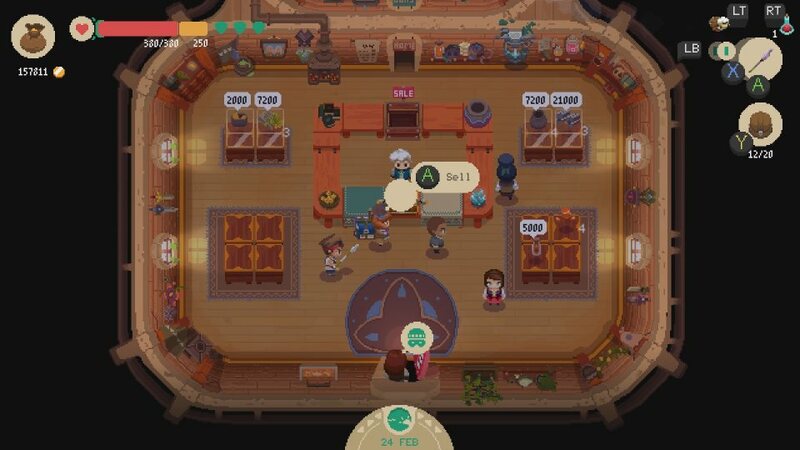 Having looted the possessions and bodies of the innocent slavering beasts, you'll then sell them in your shop, carefully tinkering with the price so that people always feel they've got a bargain, but you still make a staggering profit. Mmm, capitalism. This is occasionally awkward, especially when you get one off items. Price them high and reduce. The first time you vastly underprice something, you'll cry. Also thieves can try to run off with your stuff. The shop simulator is one of those weird genres that I always think I'll enjoy, but usually don't. The problem seems to stem from the game splitting its focus between the two aspects of sales and acquisition, and so doesn't do either brilliantly. 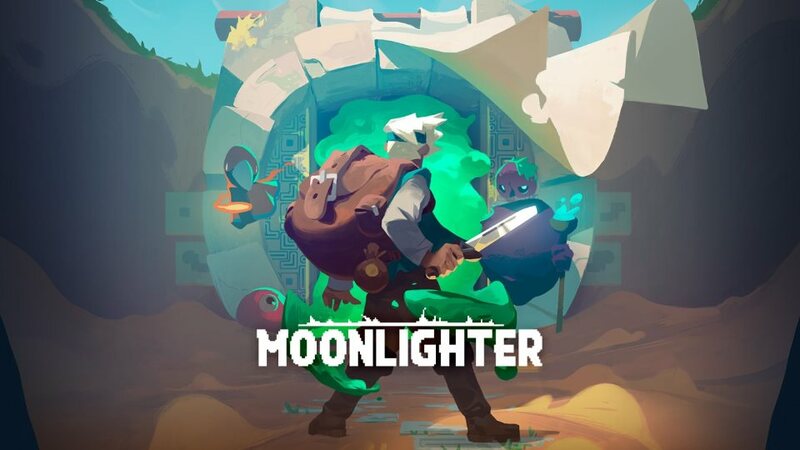 Moonlighter has solved this problem by trimming back both elements to a fairly simplistic system. It means each of them can be a bit more polished, if a little repetitive. The exploration is spread over four different dungeon types, which you unlock in sequence. Golem, Forest, Desert and Tech each have their own specific monsters and loot, and have a boss to murder at the end of them. These are loosely rogue-like, resetting each time you escape, although irritatingly, the boss doesn't regenerate. They've all got their own music, as does the town and shop etc, which is generally pleasant though a bit samey. The bosses are refreshingly different to standard monsters. When you do a dungeon run, you've got to decide whether you're going to try and make quick progress through the three levels, saving health for the more dangerous foes deeper down, or instead take your time. This will allow you to acquire more loot for the shop. This balancing act is necessary to get enough money to upgrade your gear, so you can go deeper, so you can get better loot, to get more money, to get better gear and so on and so forth. Take too long to clear a level, and an invulnerable slimer shows up. The exploration is a relatively simple top-down battler, with a range of possible weapons. I'm a fan of the spear and bow, upgraded to have a negative status effect. Other options include massive swords and weird Wolverine claws. Collection of different baddies, with a nice variety of attack methods, meaning that there's a fair bit of pattern memorisation to do. It's far more addictive than it should be. Progress is fairly slow through the minimal tech tree, with the upgrading of your shop being tied to the hardest dungeon you've reached. Nevertheless, I keep being dragged back for "one more explore". The fun of making shedloads of money out of the suckers who come to my shop is too great. Overall, it's kept me very entertained, even if it's a bit light in a few areas.